Jessy Randall and Daniel M. Shapiro. 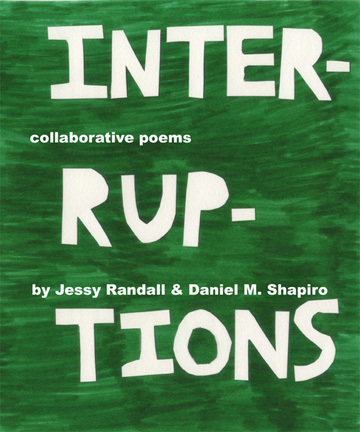 Interruptions: Collaborative Poems. Pecan Grove Press, August 2011. 56 pages. $15.00. ISBN: 9781931247900. Available from: Pecan Grove Press, Amazon, Mountain Fold Books in Colorado Springs, and maybe your local library. Readings in Colorado Springs, Chicago, and Pittsburgh. Even more about the book if you're interested. Here you'll find poems about robots, werewolves, Cheetos, math, and David Bowie. Randall and Shapiro bring out the weirdness in each other in the best possible way.